I’ve lately been doing some work with the (awesome) Unity game engine, prototyping a 2D platformer using version 4.3’s new 2D mode, and as part of that I needed to create some sprite-sheets for game-related animations and the like. As I’ve mentioned before, my tools of choice for graphical work are Inkscape and The GIMP, so I needed to put together a workflow that would allow me to draw vectors in Inkscape and then export pixels to Gimp, where I would create suitable spritesheets for import into Unity. I don’t want delve too deeply into the Inkscape/Gimp interaction in this post (I’m still stuck on Windows at the moment, so I just followed this post to get Inkscape’s “Save as XCF with layers” feature working – thanks to Chris Hillbig for the instructions). 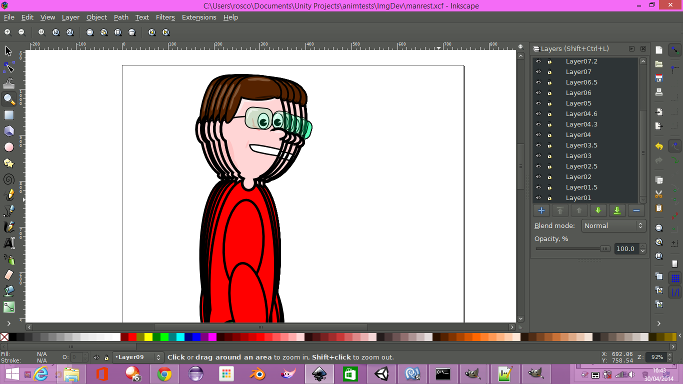 So, skipping over that part, what I ended up with was a GIMP image, made up of layers, each layer being an animation frame. I now needed to make this into a flat spritesheet, suitable for PNG export to Unity. If all this sounds a bit familiar, that’s because it’s very reminiscent of this post from September 2012 (if you’ve read that post, then thanks for sticking around for this long! ), when I was busy putting retroify.me together and needed to easily create spritesheets, in GIMP, from layered images. Of course, I initially just used the GIMP script I developed then to create my sheets, and while it did work, it wasn’t perfect. Why? Well, to explain that, I think a little background is in order. The way retroify.me works, it’s easy (and efficient) for us to use very wide spritesheets with a single row of sprites, and so the script I wrote way back in 2012 does just that – it creates a sheet that’s arbitrarily wide, with the overall height being the height of a single sprite. For Unity, however, this is non-optimal. Like most game-engines, and anything else that works directly with video hardware to provide high-performance graphics, Unity prefers its assets to be sized by powers of two. While it will happily chomp away on an image that’s 5376 pixels by 256, and even handle the slicing for me, this can result in some odd visual artifacts, and will prevent proper optimisation of the graphics in the game by the engine. I really needed to revisit my old script, and add in the ability to create images with multiple rows, to allow my spritesheets to fit neatly into power-of-two-sized images. ; Copyright (c) 2012-2014 Ross Bamford. "Create a Unity-compatible spritesheet from current image layers"